A rumor surfaced this Thursday, regarding the possibility of a Snapdragon 810 updated version of the Samsung Galaxy Note 4. Benchmark profiles appeared today on the popular website Geekbench and they seem to prove that a handset, with a model number SM-N916S is a reality. 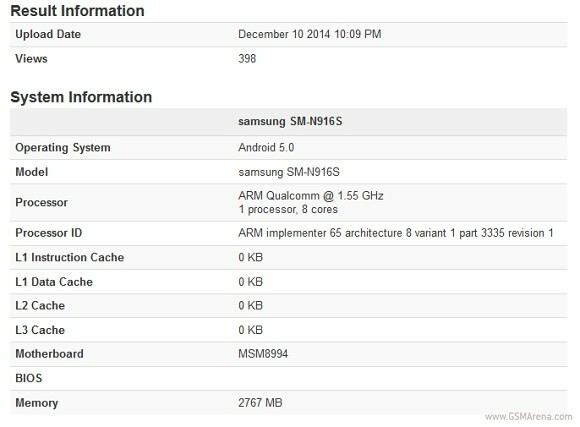 Everything points towards the appearance of a Snapdragon 810 Galaxy Note 4 variant. This seems to be turning into a pattern for the Korean manufacturer. Samsung now has sort of a history of surprising, out-of-the-blue updates to existing flagships. One fairly recent example is the Galaxy S5 LTE-A which featured the QHD display, initially rumored to appear on the Galaxy S5 itself. The hardware update might seem weird, but is quite logical when looking at the bigger picture and the recent push toward a 64-bit Android platform. Samsung is definitely not one to shy away from new trends and will presumably adopt a 64-bit architecture as soon as possible. The new Qualcomm chip is a needed step to facilitate this in the current generation Note device. The 64-bit chip is not something completely new to the Note 4. Currently there is an Exynos 5433-powered version of the phablet on the market, which is by design a 64-bit SoC. The processor, however, is limited to using a standard 32-bit instruction set at present to facilitate compatibility with its Snapdragon 805 sibling. Whether or not the Galaxy Note 4 will usher into a 64-bit era with the Android 5 Lollipop update is still unclear, but the answer should become evident early next year. OMG! Will 810 help the note 4 to gain reputation?! This is a controversial question! It's not out of date. This will only be released in South Korea. As a Note owner, I still have the hands down best smartphone (by a mile) that I can buy here.